Gone are the days of learning through repetition and dictation. 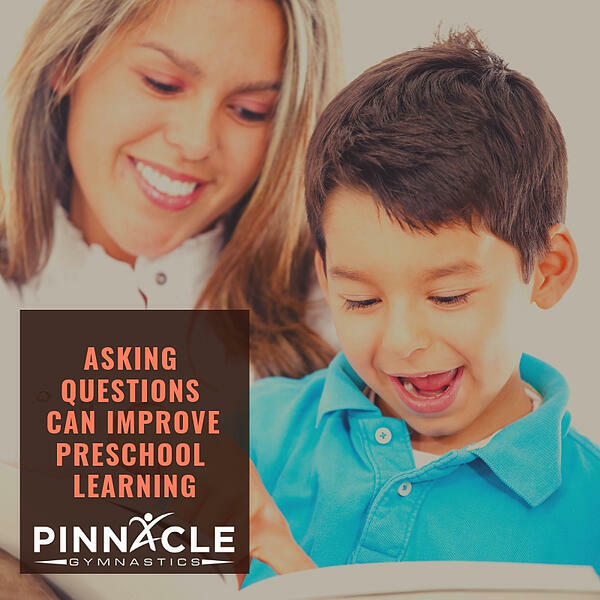 We no longer ask our students, even preschoolers, to repeat basic concepts, but instead foster a love of learning and exploration through planned questions and follow up. Learning how to ask these questions will turn your preschooler into a smart, learner and set them up for a lifetime of learning success. Question led learning is simple. You ask the questions for your child and help them explore to find the answer. As you start implementing these concepts, it will become easier and more fluid. Below are some basic guidelines for the questions you ask. 1. When planning questions, keep in mind your goals: When you are using questions to help foster learning, start with an end goal. Are you asking your child to explore the concept of hot/cold, writing, or basic addition? Keep in mind that your goal can change as the exploration happens, but try to keep a basic goal in mind. The questions you ask should help them practice these skills, as well as communicate the facts, ideas, and ways of thinking that are important to their learning. 2. Aim for direct, specific questions: Instead of beginning with a single question that is multilayered, use a sequence of questions to build up the concept. One example would be for the concept of addition: Lay out multiple colored beads on the table. Start by asking how many of a certain color is in front of them. Once they have had a chance to count, add in with "How many of red and blue beads are in front of you?" This allows for the concept of addition to be introduced in a calm, effective manner. 3. Ask one question at a time: Make sure you are not overwhelming your child with multiple questions at at time. Encourage your child to follow the same direction, finding an answer to one question before researching the next one. This will allow for focused learning, instead of half answered questions. 4. Ask various types of questions: Looking at your goal, make sure you are asking various types of questions, including open ended, focused, closed, and more. This will allow your child to look at the problem from various angles and provide for a full understanding of the concept. Adult: How do you tell the difference between hot and cold? Child: You can touch it! It feels hot and cold. Adult: What about the air? Can you tell if it is hot or cold? Can you touch it? Child: You feel it on your skin. Adult: Are you touching it? Can you tell hot and cold with other senses? Child: You can taste and touch it. Adult: What are your other senses? What do they do? Child: Smell, sight, hearing. You can do lots with them. Do you see how the conversation went from hot vs. cold, to senses? By starting with an open ended conversation but ended up building the connection between the concepts. This not only taught the children about these concepts but connections to build upon. You can also build this with a tactile project, such as guessing which items will be hot/ cold and then touching them. The possibilities are endless! What Does this Do for Your Child? Allowing your child to explore through guided learning will give them a strong concept of what they are learning. By focusing on a growth mindset, instead of rote learning, will allow your child to continue their education throughout their life. It will build a strong, focused learner, allowing them to establish a love of learning that will follow them through their educational career.